I’d like to preface this entire thing by saying that I have no intention of making this a “woe is me, my life is so hard” kind of post. This is more a way to express my own perspective on something that I have had to deal with many times in my life. Almost a year ago now, I wrote a post about the fact that I am not a religious person. It’s not really something I keep a secret, but nor is it something I bring up all the time. But it has definitely had an impact on my interactions with other people. I wanted to frame this post in a way similar to my post on common reactions to a Muslim terrorist attack, in that I’m going to address some common things I’ve heard in reaction to my non-religiosity. So here we go. The intention of this statement may not be malicious in nature, but the implication is rather condescending. Basically what this is saying is that the only reason someone wouldn’t be religious is because they haven’t taken the time to examine it, that they haven’t truly given religion a chance. But I don’t think that’s an accurate assessment of the situation. It’s well-known that there are a great number of Christians out there who openly profess their belief in God, but haven’t actually read the Bible on their own. In fact, more often than not, the people I know who have read the Bible are actually atheists who grew up Christian. At some point in their lives they encounter a “crisis of faith” for lack of a better phrase, and so they spend their time researching, examining, and generally absorbing knowledge on the subject to help make up their minds. If they find what they encounter irreconcilable with the tenets of their faith, it usually results in a loss of it. One could argue that the people who used to believe are more “in the know” than most of the people who do believe. And this was, of course, followed by a smug little smiley face drawn in the bottom corner. Now, there are multiple things wrong with this, the first of course being that not all atheists hate God. This is an over-generalization that is sadly used more often than I’d like. There is this preconception among some religious people that atheists or non-believers are all angry and bitter because they, of course, believe in nothing (which is also a misconception…people who believe in nothing or that nothing matters are more often referred to as Nihilists. Atheists are people who don’t believe in the existence of a god or deity). The second thing wrong with this is that of course you can hate fictional characters. We do it all the time. We hate Villain X in Movie Y. We hate Character A in Book B. Whether or not something or someone is real isn’t the sole criteria for being allowed to hate that particular thing or person. If that were the case, “liking” something that was fictional wouldn’t make any sense either. But the final thing about this image is how outright condescending and pretentious it is. By placing the child in the image, the author implies that the voice of the person writing the message is a child’s voice. And the implication of that is of course that the argument being made is so obvious that a child could make it, which then brings forth the assertion that all atheists are just childish and stupid. This would understandably make a non-religious person rather angry. These kinds of images are generally shared as something called “flame-bait” on the internet. What this means is that the intention is to start an argument for the sake of starting an argument. It isn’t meant to create any kind of meaningful discussion. It’s just meant to piss people off and that’s it. I’ve heard many a religious person argue that “something can’t come from nothing” when referring to the Big Bang theory. The common counter-argument is to say “well you believe in God…so where did he come from?” The reply to such a question is usually “God just is…he always was.” I’ve pointed out to people before that such a response is at the very least slightly hypocritical. They’ve just claimed that “something can’t come from nothing” but then they espouse belief in a being that literally came from nothing, who “always was”. That’s usually when people start getting defensive. They usually say something like “it’s just my personal beliefs man…no need to get so angry about it.” And the more you push back against it, the more you look like the aggressor even if they’re the ones who started the whole thing in the first place. I have no problem with people believing what they want to believe. However, I’ve always thought that if you’re truly secure in what you believe, then it should stand up to scrutiny. But too often I see people falling back on the victim card, claiming that they’re being personally attacked. And when that card is played, it’s all over. There’s no way to win against it. The more you fight, the more you lose. Oh boy…this is the big one. People of religious faith sometimes suggest that science requires faith in much the same way as religion. But is that really a true statement? The first one is simple enough. You can have faith in pretty much anything in the world: humanity, nature, society, and so on. But it is the second one I really want to focus on, specifically the part that says “based on spiritual apprehension rather than proof”. You see, the difference between science and religion comes down to their method of application. Religion, as many often say, is a spiritual and personal thing. Science however, is more impersonal. It relies on experimentation and observation rather than scripture. It all boils down to the scientific method, which begins with a question. This question generates a hypothesis, or possible answer to that question. Then, an experiment is designed and carried out as a way to see if that hypothesis is correct. After the experiment is done, conclusions are drawn from its results. If the results confirm the original hypothesis, then all is well. If the hypothesis is proven wrong, then it’s back to the drawing board to come up with a new hypothesis. Religion, however, has no such method. To put it simply, there’s a reason they call it a “leap of faith”. The thing that irks me and gets under my skin is that the same people who assert that science and religion both require faith also gleefully try to poke holes in science every chance they get. These are the people who claim that the second law of thermodynamics disproves evolution, even though that’s totally false and based on a flawed understanding of the law. These are the people who claim that “something can’t come from nothing” when talking about the Big Bang theory. This would all be fine if these people were open to discussion, but they’re usually not. I’ve already talked about how sometimes people get defensive (“it’s just my beliefs man”), but that’s only the tip of it. Often, people will get outright furious if you dare to disagree with them (and this isn’t confined to the religious either…there are non-religious people out there who can be just as arrogant and close-minded). Science isn’t perfect. It is constantly changing, constantly evolving. Albert Einstein hated the idea of quantum physics when it was first proposed, saying quote “God does not play dice with the universe” (a quote commonly misinterpreted as meaning he was a religious man…Einstein was using God as a metaphor). And now, quantum physics is a widely accepted realm of science. Evidence is always being gathered and interpreted, whether it falls in line with an already established theory or not. The scientific view of the world is not absolute, and those that practice within its various fields generally understand that. In the end, I think we all have to find our own ways of interpreting and understanding the world. Well that’s all I have for this time. Again, I would like to reinforce the idea that I am totally fine with whatever you decide you want to believe. The world is an incredibly complex place, and part of being human is coming to grips with that. I hope I didn’t come across as angry or bitter. I try my best not to, especially since I know I was a little angry with religion in my younger years. In any case, thanks for reading my rambling thoughts. Check back next Wednesday for another post, and as always, have a wonderful week. The man pulls a cigarette from a pack tucked into the breast pocket of his brown jacket and cradles in in his hands. He reaches into the pockets of his blue jeans, retrieving a silver lighter that glints in the light of the setting sun. A faint whisk of orange flame flares into existence, and a moment later a wispy trail of smoke snakes through the air. He inhales. And exhales, a cloud of smoke billowing forth from his mouth. The doctor says they’ll kill him. He doesn’t care. They help him relax. He stands next to a small, dying tree in the backyard. It is a lonely place, a farmhouse that has seen better years. The gray paint is beginning to chip and fade away, and the screen door on the porch no longer shuts all the way. It awkwardly clatters in the wind, banging against its frame. The sun slowly sinks below the western horizon, the yellow light washing over the land gradually transforming into a faint orange glaze. Off in the distant woods, the man can already hear the twittering of insects waking themselves up for the night. He holds the cigarette in his left hand, which still feels awkward to him, as he had been right-handed his entire life. He looks down at the awkward stump that used to be his hand. He is not wearing the prosthetic at the moment. It makes him itch, and he doesn’t enjoy how that feels. Without it, he can feel the phantom of his hand. He can feel the flexing fingers, the bending wrist. It is no longer there of course, and what remains of it lies among the dust and dirt of a land far from here. He closes his eyes. Ethereal sounds of an explosion reach his ears. The memories of the burning pain and the fear are just as powerful as if it had happened yesterday. It fades. His eyes open again. The sun is now little more than an orange smudge on the horizon. He takes several more inhales of his cigarette, watching the giver of light sink below the curve of the planet. When it is gone from sight he throws the cigarette to the ground, extinguishes it with his shoe, and trudges back toward the house. The above paragraph is not based on anyone in particular. It’s simply something I made up on my own. However, it serves as a good scene setter for what I want to talk about today. I’ve long thought over the idea of “supporting the troops” versus “supporting the war”. For some people (especially those of the conservative bent), there’s really no distinction between the two. To support the troops, you support the war. Which is why whenever someone says they’re against the war, these people tend to get very angry. They see anti-war people as ungrateful and disrespectful toward those serving in the military. But is there really no distinction between the two? I think there is. Here’s the way I see it. I don’t like war on a general level. I think it’s a last resort option for people who lack the ability to compromise with each other. However I also recognize that, in a way, it’s inevitable where human nature is concerned. We are a tribal sort of people, drawing lines in the sand all over the place. When others outside of our specific group cross those lines, we tend to get angry. And when pushed far enough, that anger will explode into violent action. I was against the war in Iraq. I honestly believe we shouldn’t have gone in there in the first place (although I recognize that some good did come out of it, especially where Saddam Hussein is concerned). But that doesn’t mean that I actively wished the U.S. troops ill. Quite the opposite. I wanted them to come home. I wanted them to see their families again. I didn’t want them to breathe their last so far from the home they’ve known all their lives. But to some people, that doesn’t matter. To support the troops, you support the war. And doing anything otherwise is considered being against the troops. This incredible, patriotic zeal can likely be traced back to the aftermath of 9/11. Following the horrific attack, people weren’t willing to question or provide explanations for why it happened. And those who did were almost universally shunned by the public. This lack of an answer for “why” allowed then-president George W. Bush to step in with his “they hate freedom” rhetoric that propelled us into the Afghanistan and Iraq wars. And to a certain extent, I understand how this happened. We here in the United States felt so secure and so safe. And then suddenly, that illusion faded. We were left scrambling to pick up the pieces. Our nerves were frayed. Our minds were shot. And it is far easier to create a simplistic rhetoric of “good vs. evil” than it is to explain all the underlying factors that led to such an event, such as the anger over U.S. troops being posted just outside Saudi Arabia. And here’s the thing: these two wars didn’t really accomplish much. Sure, we took out two very bad guys, but in the end it was in many ways a hollow victory. In doing what we did, we destabilized the region to such an extent that various insurgent groups sprang up and began vying for control (especially in Iraq). It could be argued that this destabilization inevitably created the conditions which lead to the rise of ISIS. And we all know ISIS, don’t we? This is what I mean by supporting the troops, but not supporting the war. There are far too many variables, far too many factors at play in the world to reduce everything to such simplistic terms as “good” and “evil”, “right” and “wrong”. Don’t misunderstand me, ISIS is a terrible and hated group and we should be doing our best to stop them. But if we don’t learn from our past, all we’re going to do is set the stage for another group to rise following ISIS’s fall. We reap what we sow, to borrow a philosophical cliché. I support the troops, but I don’t support the war. I support the people, but I don’t support the violence. And that’s all there is to it. Thanks for reading! Tune in next Wednesday for another post, and as always, have a wonderful week. I’ve never been a big fan of people who complain that something isn’t realistic when it comes to a story. At some point we have to recognize that a story constructed by an author isn’t going to be entirely realistic. They’re written for the express purpose of entertainment or enjoyment on the part of the audience. But I think the complaint gets even more ridiculous when it’s leveled at a video game. So today let’s look at several reasons why video games aren’t realistic (and never should be). You get shot. What do you do? It’s easy. You just crouch behind a wall for a few seconds and wait for the wound to heal. Oh…wait a second…I don’t think that’s how it works. In real life, when you get shot, you can’t just magically heal the damage seconds later. Neither can you pick up a medical kit and not suffer from a bullet wound immediately after its use. Instead, getting shot usually involves a trip to the hospital and a lot of pain. And if there’s no exit wound that means the bullet or bullets are still in your body and need to be extracted, which means even more pain. And after all of that, you still need to spend days, even weeks in the hospital to recuperate. The human body isn’t an instantaneous healer. It needs time to do its thing. Can you imagine if a game actually did that? You get shot and you’re not allowed to play for several days because your character needs to heal. Sounds boring right? Like, holy crap, there’s so much death. THERE’S SO MUCH DEATH. Ever heard of the game Dead Rising? It’s a game about the dead, and how they rise. Pretty self-explanatory. Well there’s an achievement in the game called Zombie Genocider which you unlock after killing 53,594 zombies in a single playthrough of the story mode. Why such a specific number? Because it’s the total population of the town the game takes place in. Yep, that’s right. When you unlock this achievement the game is literally saying “hey congratulations, you just slaughtered an entire town!” And not only that, but there’s still zombies running around. What, are the zombies having zombie babies or something? Nope. It’s just the game developers cheeky way of pointing out that games aren’t realistic. If you could completely depopulate the game world of enemies it would not only make the game too easy, but it would be boring as well. And that’s not even mentioning how unrealistically violent and over the top Dead Rising is. This is a game where you fight zombies with items including but not limited to: katanas, water guns, beach balls, televisions, guitars, pistols, assault rifles, cars, hockey sticks, footballs, grenades, and cash registers. The hyper violent nature shows us that it was never meant to emulate real life. And then there’s Grand Theft Auto. Oh boy…Grand Theft Auto. Despite how the games try to re-create a real life city, the games themselves are not realistic in the slightest. I mean imagine you’re driving down a road, just going to the grocery store or something, when suddenly some jerk in a military helicopter (which he somehow managed to steal from a HEAVILY GUARDED MILITARY COMPOUND) flies by and blows you up with rockets. No reason, no provocation…just mindless violence. And now you’re dead. Real life is not this dangerous (despite what the media might want you to think). People don’t just break out into wanton rampages of death and destruction while carrying multiple pistols, assault rifles, a rocket launcher, a minigun and dozens of grenades. It just doesn’t happen. And furthermore, when they’re finally stopped, they don’t just get out of the hospital or jail six hours later. They’re either dead or on death row. Video games are meant as escapist fantasies. They’re meant to be unrealistic. People have the ability to differentiate between fantasy and reality. Sorry Jack Thompson but it’s true, no matter how vigorously you crusade against video games or how antagonistic you are towards people who disagree with you. Maybe that’s why you got disbarred from practicing law. Just a thought. I mentioned this before, but real life is not scripted in the same way as a story is in a video game, book, or movie. You don’t run into, say, some homeless guy and think to yourself “I bet this character will show up later on in my life. Is he the antagonist in disguise? A mentor of sorts? Some strange alien being trying to guide me to the right path?” You’re far more likely to think to yourself “man that guy looks lazy…why doesn’t he just get a job?” Well, far more likely if you’re an uptight jerk that is. In real life people enter and exit your life without rhyme or reason. In a carefully constructed story crafted by an author, every little thing has some significance or purpose. The aforementioned homeless guy provides us with a good example. If he appears in a story, the author likely wants you to pay attention to how the character interacts with him. Does the interaction hint at some kind of development down the line. Is the character someone else in disguise, and if so how does the author foreshadow this? It might not even be something as large-scale as that. The homeless guy might just serve as a character building tool. Does the main character stop and give him money? Does he continue on his way but regret his decision later? Does he spurn the man, calling him a “lazy piece of trash”? Moments like this can tell us much about the protagonist’s state of mind and his way of viewing the world. In real life only you know your inner thoughts. Well…you and the Illuminati. Because the Illuminati knows all. No I didn’t make a post about conspiracy theories a couple of weeks ago. I have no idea what you’re talking about. In life you need to eat. You need to drink. You need to use the bathroom. You need to sleep. And so on and so forth. But when I make my character in Fallout 4 stay up for an entire week exploring the dystopian ruins of Boston, he doesn’t complain. He doesn’t fall asleep on his feet. His stomach doesn’t grumble and he doesn’t die from dehydration. Because he’s dead inside…a soulless husk…a puppet controlled by my whims and commands. Maybe he doesn’t want to kill those people. Maybe he doesn’t like using guns. It doesn’t matter. I am in control. In all seriousness though games usually don’t bother making you tend to real world needs of your characters (unless you’re playing survival games, but even then the requirements for eating and drinking are usually skewed for the sake of making the game fun to play). You don’t want to be blowing things up and causing chaos when suddenly your character says “man…I could really use a burger”. Ain’t nobody got time for your burger man. We got stuff to explode. Video game characters don’t need to eat, drink, sleep, or even go to the bathroom most of the time. They are but digital representations of people, bound only by the logic game developers create for them. They might not even speak, as is the case for many a silent protagonist in video games. So here’s the thing, if you’re going to be complaining about how it’s unrealistic that a character could survive some explosion and make it out alive, you might as well be complaining that they don’t eat, sleep, take a piss, and so on. Realism for realism’s sake doesn’t really belong in a video game. Realism should serve the purpose of fun for the game, tweaked and modified as necessary to keep the player engaged and enjoying the experience. I can’t imagine how I would have felt playing Myst if the player character suddenly needed to pee. Well guess what? There are no bathrooms on the island of Myst. Nope, not a single one. Looks like you’re peeing in the ocean bro. Thanks for reading. Check back next Wednesday for another post, and as always, have a wonderful week! From very early on in this blog, I made it obvious that I love point and click adventure games. Myst was and still is one of my favorite games of all time. But what exactly happened to the point and click genre. I’ve talked about it briefly, but I never got into too many specifics. These games were beloved by many back in the ’80s and ’90s, so what exactly changed in the world of games to make them seem so obsolete? Well, to find that out, we have to start at the beginning. The story of point and click adventure games begins with their predecessor, the text adventure game. Many people known of Zork, the series of games that began in 1980 (technically it was released earlier under a different name, but this was when it was first released as Zork). But alas, Zork was not the first game of its kind. The first text adventure game and likely the first adventure game ever made was Colossal Cave Adventure in 1976. Text-based adventure games were very simplistic. They described a scene to you exclusively through text and you typed in commands to advance the game. Initially, commands had to be very simple (i.e. “get key” or “go north”). But as time went on, the technology evolved and the commands were allowed to be more advanced (i.e. “take the key from the table”). These text games would set the stage for what would be called “graphic adventure games”. This would start the transition into the dominant age of the adventure game genre. As the technology behind computers became more and more advanced, games were allowed to ditch the text-exclusive format and start moving in a direction based on visuals, allowing for greater immersion on the part of the player. 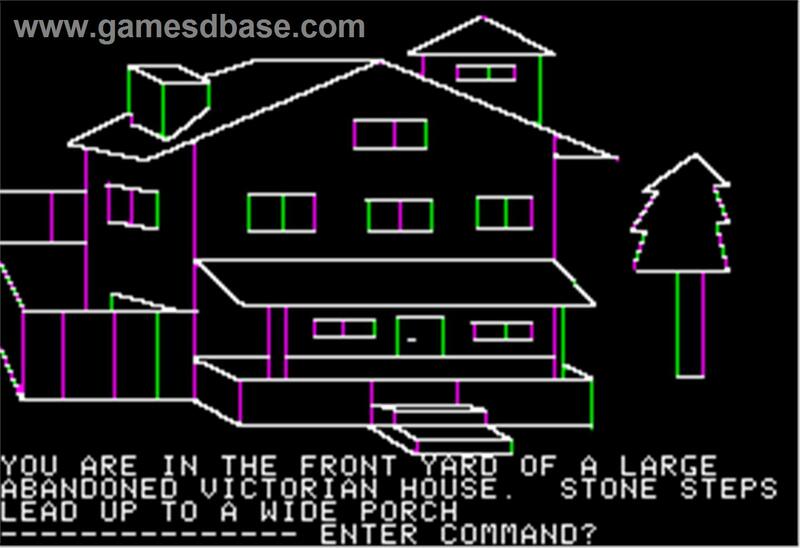 This style of art is known as “vector graphics” and as you can see Mystery House still used the text command interface. Vector graphics gave way to “bitmap graphics”, which allowed games to show the player character moving in response to the player commands. Games like the King’s Quest series used this style to great effect. As the graphical quality of games grew more and more advanced, they moved away from the text-based command inputs, instead using an interface where a player could move a cursor around on-screen and click on objects to have their character interact with them. This, my friends, is the essence of what a point and click game is. The late ’80s, early ’90s were the heyday of the point and click genre. Technology got better and better. Voice acting was introduced. Games gained three-dimensional graphics. Video games were rapidly evolving to new levels hitherto unseen in the medium. This era is when games like Gabriel Knight and Grim Fandango were released. This period also saw the rise of more puzzle oriented games. Puzzles were present in older adventure games, but were typically relegated to inventory-style puzzles (as in “give this item to this person” in order to progress). But newer games started moving away from that and focused on puzzles which required interaction with objects in the environment itself. There are two major games from this period, both released in 1993, that popularized the puzzle heavy approach to adventure games: Myst and The 7th Guest. The 7th Guest was arguably the game with more puzzles. In fact, from what I remember when I played it a few years back, it was pretty much ALL puzzles (part of the reason I personally consider the game inferior to Myst is that some of the puzzles require far too much effort on the part of the player). It featured a lot of full motion video (prerecorded video files featuring live actors). Nowadays, The 7th Guest seems incredibly cheesy. It has an over the top flair that doesn’t translate well into modern gaming. Myst, on the other hand, fared far better. For comparison, Myst spawned five sequels and a spinoff game, whereas The 7th Guest had only one sequel to its name. A big reason for this was Myst‘s reliance on atmosphere instead of voice acting. There were very few characters in the game. Instead, the game’s story was told through notes and books. Also compared to The 7th Guest, Myst‘s puzzles were tied to the world itself. There was always some kind of logic behind it. Often all you needed was a clue hidden somewhere else in the environment. Myst was atypical for the genre, in that it didn’t have a heavily defined goal for the player. You were left to your own devices to wander the island and solve its mysteries. It was considered to be one of the most influential games of its time as well as the “killer app” that sparked widespread adoption of the CD-ROM technology. Ironically, Myst‘s overwhelming success was part of what led to the downfall of the point and click genre. At this point in time, video games had become much more of an industry, and like any industry it was driven by trends. Myst became the trend, holding the record for best-selling computer game until it was beaten out by The Sims in 2000. So the genre saw an influx of games trying to emulate Myst, causing it to become stale. But this wasn’t the only contributor to its downfall. Remember how the evolution of technology contributed to the rise of the adventure game genre? Well that also led to it falling out of favor (at least in the United States…the genre remained popular in Europe). The advent of first-person shooters such as Doom and Half-Life meant that these games were able to offer strong, story-driven games but with an emphasis on action gameplay. By comparison, adventure games seemed archaic, bound by a framework that couldn’t seem to evolve beyond Myst. But in another strange twist of fate, the fall was not the end. The growth of digital distribution and touch-screen interfaces provided avenues to re-release old adventure games. And digital distribution in particular led to the rise of episodic adventure games, games with a story structure modeled after televisions shows. Each “episode” of the game is released separately, but players can usually opt in to buying a “season pass” so they’ll have access to each episode the moment they come out. Telltale Games found great success with their Walking Dead episodic games series based off the comics and have made many episodic series based off franchises like Game of Thrones and Back to the Future. This resurgence of the genre also led to what people often deride as “walking simulators”, games primarily focused on telling a story through exploration and discovery rather than solving puzzles. I have spoken about one of these games many times, Gone Home. Gone Home tells the story of a girl returning home after a year abroad and finding her house empty. The game centers around her searching the house to find out where everyone is and revealing the story of her family over the year she was absent. It’s a very touching little story in my opinion although many gamers despised it, some going so far as to argue that it isn’t a game. Often, in this ever-increasing digital world, old things can become new once again. Will games ever go back to the simplistic point and click games of yore? Probably not, nor should they. Like any other medium, games should be driven by innovation and evolution. Every trend will eventually fall out of favor, leading to new and interesting ideas. But even if you don’t like the current trend, the modern age of gaming has far more avenues for indie game development, leading to plenty of lesser-known games that might scratch that niche itch you have. Technology is a strange and wonderful thing, isn’t it?